I frequently get messages from readers pleading for recipes which don’t require scales—most Indian “andaaz”-based kitchens, they say, simply don’t possess a set. Although I recommend investing in scales if you’re at all keen to explore home baking—personally, I’m a slave to mine—I come from a long line of cooks who weren’t. My mother, an excellent baker, would have been completely at home in an Indian kitchen, using a tablespoon to measure everything—at least until she went through a weird midlife crisis Cordon Bleu phase in the 1970s. I have inherited her beautiful, but now rather thin and worn, old spoon and use it most days—it makes me feel as if I’m stirring some magic into a cake or biscuit mixture. Today, I have used it as the base measure for a gorgeous, fruity sponge cake which is a perfect showcase for every glorious soft fruit about to make its way down from the Himalayas: I’ve used the fragrant little peaches which are in season briefly now, but you could substitute apricots, plums, cherries and later the apples and pears. 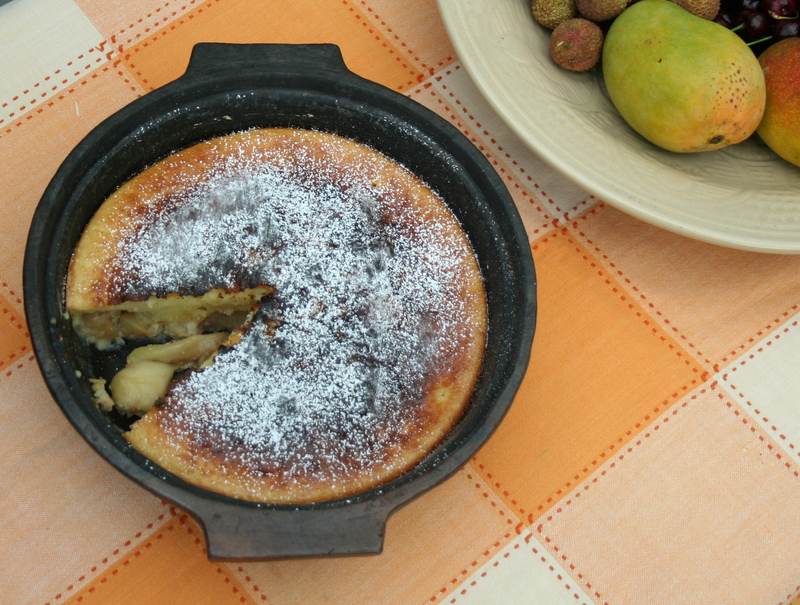 It’s inspired by a wonderful recipe in Jane Grigson’s 1982 masterpiece Fruit Book,given to the author by the owner of the village store near her French home. This, along with its companion volume on vegetables, is a book I refer to constantly—in fact, my copy falls open at this recipe’s page. Grigson named it Tarte de Cambraibut it’s really more of a cake. It requires minimal time in the kitchen—ideal for the next few months—about 5 minutes if you use fresh chopped fruit. I decided to use some peaches I had poached in a vanilla syrup first, again with imprecise measurements. I think it takes the cake up to new (Himalayan) heights. A word about the tablespoon measure: My mother’s spoon, heaped with flour or slightly rounded with caster sugar, measures one ounce (approximately 25g) but as long as you use the same spoon throughout, it doesn’t really matter, your cake will just be larger or smaller according to your spoon size—the main thing is to keep the ratios the same. First prepare the fruit: Dissolve the sugar and water in a pan large enough to hold all the peaches and bring to a boil. Place the peaches in the syrup and let them simmer for 3 minutes, no longer. Lift the peaches out of the syrup and when cool enough to handle, remove the skins. Slit the vanilla pods and remove the seeds. Add both pods and seeds to the sugar syrup, then put the peaches back in and leave to cool to soak up some of the vanilla flavour. When you’re ready to make the cake, preheat the oven to 200 degrees Celsius. Grease something to bake the cake in. This also can be flexible. I used my beautiful Assamese earthenware dish but it works equally well in Pyrex or a metal cake or pie tin. Just make sure to grease it well. Remove the stones from the peaches and lay them in the baking dish to form a single layer—you might not need them all but whatever’s left is delicious with a dollop of cream. Measure all the ingredients into a bowl with your trusty tablespoon, then whisk to mix, or use a mixer. Pour the mixture, which will be like a batter, over the peaches. Put small dabs of butter over the surface along with a sprinkling of caster sugar. Bake for about 35-45 minutes until a skewer prodded into the centre comes out clean. Eat straight from the oven with thick cream or cold later. Every July, when the Delhi heat has rendered us senseless and my kitchen a no-go area, we pack up and head for the hills. With the promise of a month’s sweat-free cooking in Himachal Pradesh, our old Ambassador is stuffed to the gills with everything from cherry-stoners and muffin trays to pasta machine and oven. Our convoy (one car for us, one for the contents of the kitchen) left Delhi at dawn last Sunday: 16 hours, 3 dhaba stops, 25 podcasts and one puncture later, we arrived at our summer home, a tiny cottage nestling in an apple orchard in the village of Batahar. Life in Batahar and most of the surrounding villages goes on pretty much as it has for hundreds of years. Despite the arrival of electricity and satellite TV in the traditional Kathkuni houses, villagers with chiselled, weather-beaten features dressed in tweed pinafores and headscarves still trudge up and down the lane with baskets of animal feed strapped to their backs, wheat is ground at the water mill, and clothes scrubbed in mountain streams. One of my favourite sights when we walk our dogs in the morning is village women settling down to a few hours’ quality knitting while their cows graze in the mountain pastures. We’ll be here for the next month, counting our blessings every day as we wake up to birdsong, blue skies and distant snow-capped peaks. And yes, from our verandah, we can reach out and pick apples and pears. When we leave in August, the apple harvest will be in full swing but right now it’s peak soft fruit season, the orchards groaning with luscious peaches, apricots and plums. These are the fruits of imagination – they taste, gloriously, of themselves, not that watery approximation we get in supermarkets at home. on which our Amby has about one millimetre to spare on each side, to stock up on essentials. Stopping at a roadside fruit stall on the way, a man rushed out and urged us to try his ‘raspberries’. These turned out to be small green plums, a type of greengage or Mirabelle perhaps, but with a sweetness verging on, well, raspberry-ness. We took away a box each of red plums, pears and the disputed green fruit at assuredly ‘no-tourist prices’. I wasn’t even paying attention to the price, I was already mentally flicking through Jane Grigson’s ‘Fruit Book’ trying to decide on how best to use my bounty. No sooner had we got back to the house than Chaman, our endlessly resourceful landlord (the other day he found an Ambassador inner tube in a Hindustan Motors-free state) popped in with a huge basket of plums and pounds of peaches from his own orchard. Suddenly I’m starting to panic about using up this abundance before it turns to compost. But where to look for inspiration? Surely there must be hundreds of local recipes to track down? Jane Austen once said ‘Good apple pies are a considerable part of our domestic happiness’. Not in Himachal Pradesh though – here, the only place you find pies is in the Hippy hangouts in Old Manali – and I’m not recommending that as a culinary treat. Elsewhere, in local restaurants and homes, I’ve yet to find a single other use for the local summer bounty apart from the (admittedly fabulous) juice. My guess is that the reason for this is two-fold: firstly, the fruit is not native to India, it was brought here by the British. Secondly, there is no local tradition of home baking. In Europe, apples are put into pies, puddings, jams, soups and sauces;they accompany pork and pheasant and are laid down for the winter as pickles and preserves. And so it is to Jane Grigson’s master work that I turn(I always bring it to Kullu, along with the companion vegetable volume, partly because much of the book was written during Grigson family holidays at their similarly local produce-abundant summer home in France). To my delight there are 22 pages and 21 recipes devoted to plums alone. So far, I’ve made a wonderfully tart Plum Crumble, which disappeared before I could take a picture; I’m planning Grigson’s ‘Mirabelle and Almond Tart’ and I’’m stockpiling sugar and jars for a jam-making spree. Any other suggestions gratefully received. Place plum halves, cut side up in an oven proof dish. Sprinkle with butter and sugar according to the sourness of the fruit. Pop into the oven for about 15 minutes until the jiuce starts to run from the plums. In a bowl rub the butter into the flour until mixture resembles breadcrumbs. Stir in the sugar then sprinkle over the plums. Return to the oven for about 25 minutes until the topping is light brown with bright red juices bursting through. Serve with fridge-cold cream. Alas poor Jane never made it to this part of the world to see if what she wrote was true. I did, although I’ve taken my time with chickoo – perhaps because of its unappealing potato-like appearance which always seems to mutter ‘don’t buy me’. Well, more fool me, I now know what I’ve been missing. With its unassuming, nothing-to-prove manners, and malty, caramelly, demerara graininess, the chickoo has won me over completely. the world's least inviting fruit? I first discovered it during a recent trip to Old Delhi to chronicle ‘Fruit Sandwiches’, (more of this soon). Along with our mango and paneer sarnies, we were given chickoo milkshake. I was completely distracted from the job in hand – pure decadence from first sip to last. When you get beyond the dull brown skin, the chickoo flesh is the most beautiful pinkish-beige and contains 4 shiny black seeds. It’s the kind of sweetness you can’t believe exists in nature. Now, Chickoo Milkshake is a new component of my mid-afternoon meltdown routine which includes, on an ideal day, a cool shower and 10 minutes drifting off to ‘The Archers’ on my ipod. All of which I intend to try, if I ever tire of the milkshake. Blend the ingredients till smooth. If temperatures get beyond 43, add ice cream.